Book with Flash Sport Fishing Charters in San Francisco and take part in one of the most sought-after fishing trips in the world: shark fishing. Whether you have been fishing your whole life or this is your first time with a rod and reel, Pacific shark fishing will thrill you with a new adventure. Lead by Captain Steve Talmadge, you and your friends and family will explore the deep and shallow waters where sharks are known to dwell. Once you get a shark on the line, Captain and crew will help you safely bring it aboard. Few anglers can say they have battled a genuine Pacific shark. Shark fishing is one of the greatest fishing tales you can have and top your list of great vacation stories. The San Francisco Bay Area is home to 11 species of sharks, some which can grow up to 18 feet long and weigh up to 600 pounds. The beautifully-spotted leopard shark, common to the Bay Area, is not only a visual spectacle, but also a giant that can grow over six feet. The famous sixgill and sevengill sharks can weigh hundreds of pounds and the thresher shark, the largest shark in the West Coast, lives up to its name. Whatever type of shark you are looking for and whatever you reel in, Captain Steve’s crew will ensure everyone is safe and everyone enjoys a fun, exhilarating trip. The crew will help you hold the shark for a incredible photo! Make unforgettable memories, bring back a great story, photo and even bring back a trophy shark if desired. 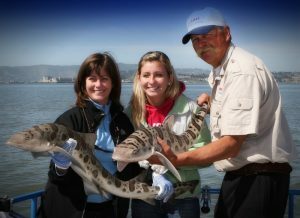 Call today to schedule San Francisco shark fishing tours at Flash Sport Fishing Charters.